Tired of explaining why you are not ordering a full meal at a restaurant? With help from Ambassador Rose Hoelle, Oley developed a Restaurant Card to make your task easier. The cards are small enough to fit in your wallet and are intended to be shared with wait staff. Order a Restaurant Card FREE of charge on our online store. 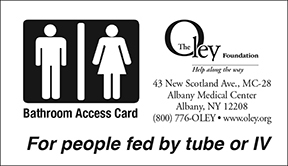 We’ve also developed a card to help Oley members gain access to a public restroom in a quiet, private manner. The cards are small enough to fit in your wallet and are intended to be shared with employees at stores, gas stations, office buildings, etc. Order a Bathroom Access Card FREE of charge on our online store.